The program is aimed at the solution under static loading of two classes of problems encountered in structural engineering: a soil-supported mat or a soil-supported structural slab. The mat or structural slab is modeled with linear finite elements. The shape may be rectangular, round, or irregular and the thickness may vary. For the soil-supported mat, the soil is assumed to have a linear response which is defined with the subgrade modulus and is characterized by a set of springs which can vary in stiffness at points under the mat. The springs can reflect horizontal as well as vertical resistances. The solution follows the classical Winkler model. This method of modeling soil has been widely used in the analysis of flexible beams and mats on elastic materials. When a structural slab is analyzed, supports can be assumed to exist at the edges or along the interior of the slab, as for beams. The edges of the slab are assumed to be simply supported or subjected to a moment. The supports for the slab may be assumed to be unyielding or specified with a set of deflections. Iteration may be performed externally to get agreement between deflection of the slab and that of the supporting beams. 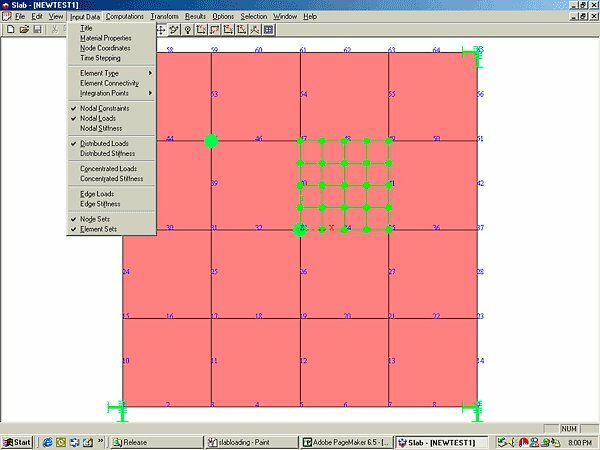 Geo-Mat allows the user to specify loadings on the surface of the mat or slab as uniform, distributed, or concentrated (from columns). Horizontal as well as vertical loads may be applied. 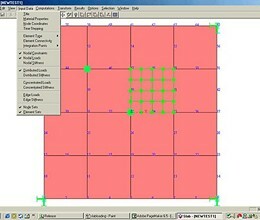 * GeoMat download link provides demo version of the software. Analysis and design of complex mat foundations and combined footings. GeoMat has been rated 5.0 out of 5 points. A total of 1 votes cast and 0 users reviewed the software.